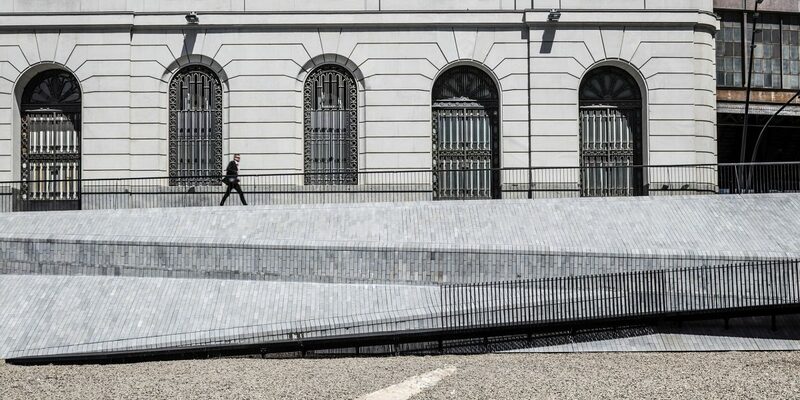 The main aim of the project was to integrate the urban space surrounding the Estació de França Train Station and the old Baluard del Migdia into the pedestrian network of Barcelona’s Old Town. This intervention will allow the connection of two neighbourhoods in the centre of town – the Ribera and the Barceloneta neighbourhoods- that historically were disconnected at this point. On the other hand, the existence of the archaeological remains of the old Baluard del Migdia, the sea ramparts and the counterscarp built at the beginning of the 18th century configure a new urban landscape. The project encompasses and resolves the environs of the old Baluard (ramparts), creating a viewing balcony and a ramp with access limited to occasional visits. The archaeological findings determined that the sea came in to this point in the 3rd century and that it was possible to navigate here until the 15th century when a breakwater was built. The land gained ground from the sea and in this area the Baluard del Migdia and the sea wall were built between the 17th and 19th centuries. The intervention recuperates the archaeological ensemble of the old maritime front, exhibits the lower level of the existing trench between the sea walls and, simultaneously, creates an urban space around the perimeter. The area next to the old Estació de França Train Station incorporates an extensive area planted with trees with white blossom and zones with benches and draining paving and sub-bases.